We don't want to do less. You might find that our prices are lower than you expected, but our reason for this is simple. 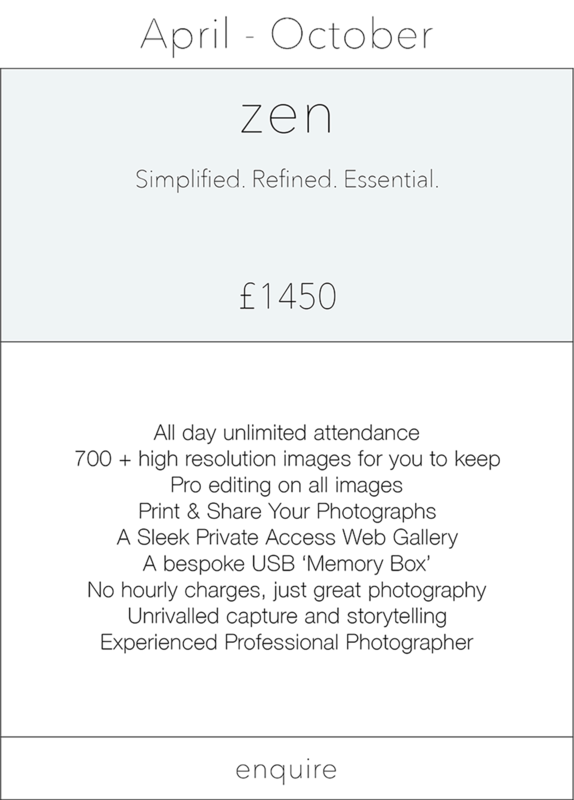 We don’t believe that we have to over-charge for our services to create the best photographic document of your wedding. It’s all about giving you the best quality, the most time, and all the value we can without it costing you the earth and without compromising our business. 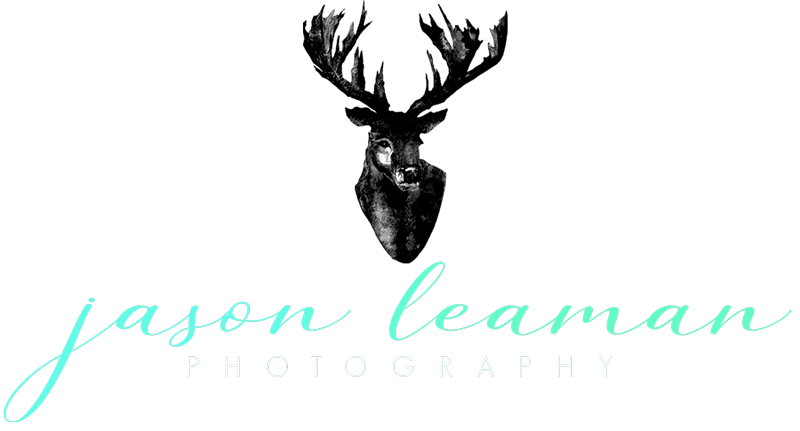 The photography and the commitment to telling your story are the same high standards whether it’s a small week-day wedding in a register office or if it’s a large country house wedding with all of the extras. 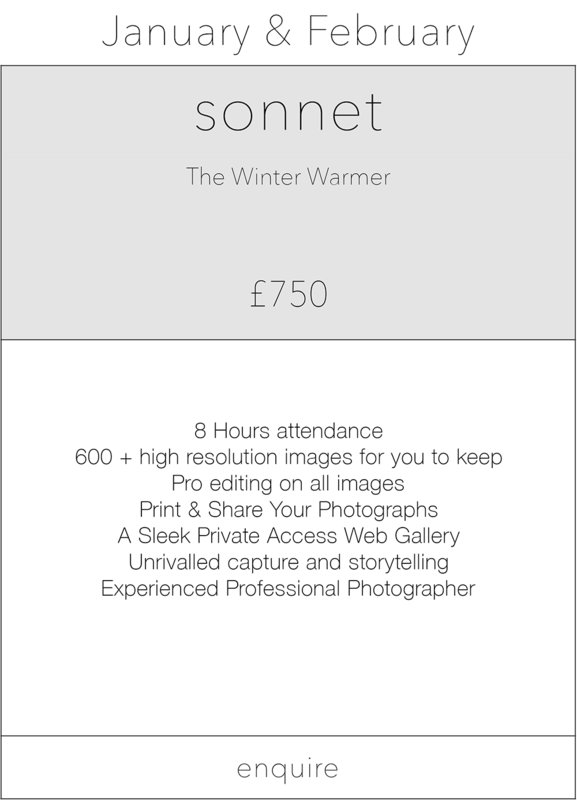 These are our prices – beautifully refined to tell your story in the most accessible way. We invite you to discover just how flexible and accommodating we are on our VIP page. Use the form to check our availability, and we’ll send you the VIP link. You’ll find the full breakdown of everything we do and everything you need, so you can start getting started. These are our main packages. Comprehensive, honest, and realistic. We’ve simplified things here to show off the core value. You can really get into the detail and the flexibility of these packages in our VIP Area. We have a vast range of bespoke options to enhance any of our packages – all available to see on our VIP Page. All you have to do is fill out the form and we’ll send you the password for your red-carpet VIP access all areas pass. Together is our name for the pre-wedding photo session. Sometimes essential, always a giggle. Not actually a photo booth at all! You’re going to need to ask how this works, but trust me, it’s a winner. Lots of Winter Season couples find that adding the Photo Booth acts as a great wet wedding backup, but it’s great all year round, rain or shine. We believe that photographs are the most important take-away from your wedding. The final say in a moment in your lives that you will treasure forever. An album is a luxury product and as our lives become more and more digital printing your photographs is even more vital than ever. 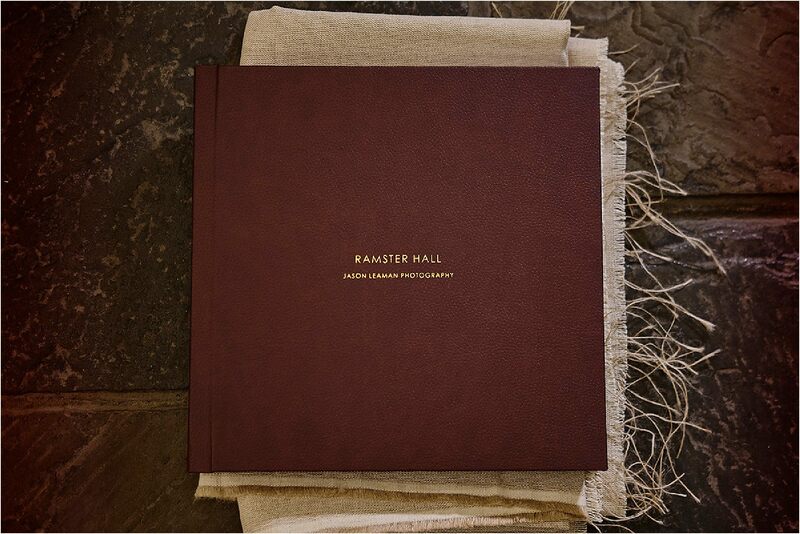 Our albums are incredibly high quality, hand made, and super bespoke. They are personal, tactile, and unmistakably you. We don’t want to do less work. We can do more. We work together as a husband and wife team, and we’re very busy. Jason takes the pictures and Carrie helps run the business and the editing and all the BTS stuff. This means that we don’t have to limit our bookings down to 25 or 35 weddings per year, because we can still push through all of the work that we have to do without compromising on the quality of our services. This is important. If we are available to photograph your wedding we will be there. Our prices mean that we get enquiries and bookings for next year coming in all the time, but you’d be surprised at what dates are still available this year. We can take on as many weddings as we can take on, and it’s not a quantity over quality issue at all. 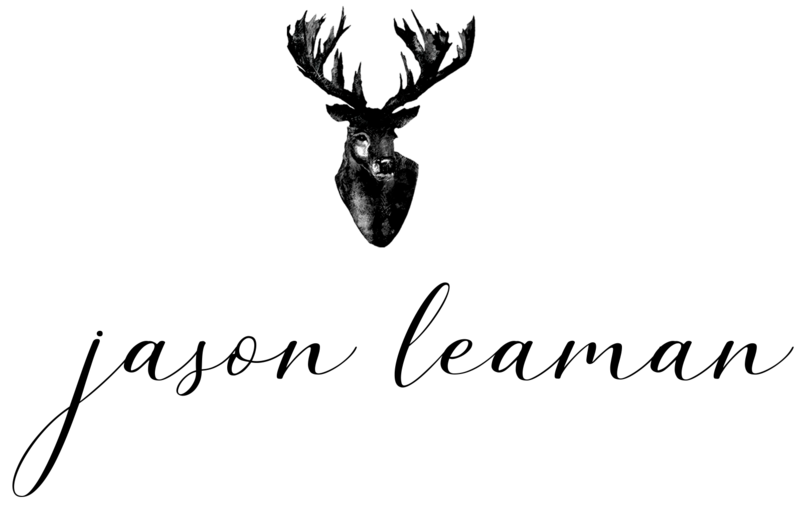 High quality photography. High energy capture. Dedicated and enthusiastic about being there. This is what we do. It’s our work. I don’t watch the clock on the day and we don’t charge by the hour. That’s what unlimited means. No 7 Hour day, no 8 hour limit, no 5 hour special price. If you need me there for 8 hours or 15 hours (it happens!) I’m there. If your wedding is particularly small then we have a lower priced off-peak package for that. The aim is commitment and the goal is value. Your wedding will be what it needs to be. More often than not that means it will be a long day, and we don’t want you to have to push your budget for the coverage that you’re going to need. We’re not going to ask that you pay a premium for what is essentially a few hours more. Our prices are carefully figured out to be where they should be, without having to charge you more for the coverage you need. Our Winter Season is now Between November through to the end of March. It’s the same unlimited approach to photography and the same care and attention to detail. January and February – traditionally quieter months in the Wedding industry – are available for a huge discount. 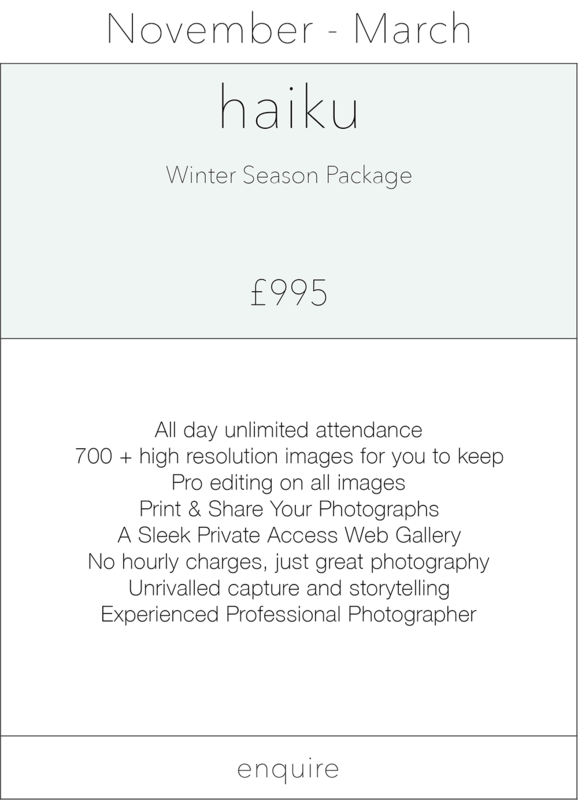 Coverage is for 8 hours as standard, and you can boost this up to our Haiku package if you want more and still hit the sub £1000 mark. We believe that printing your Wedding Photographs is the definitive way to enjoy your pictures, and our albums are as beautiful as the are unique. 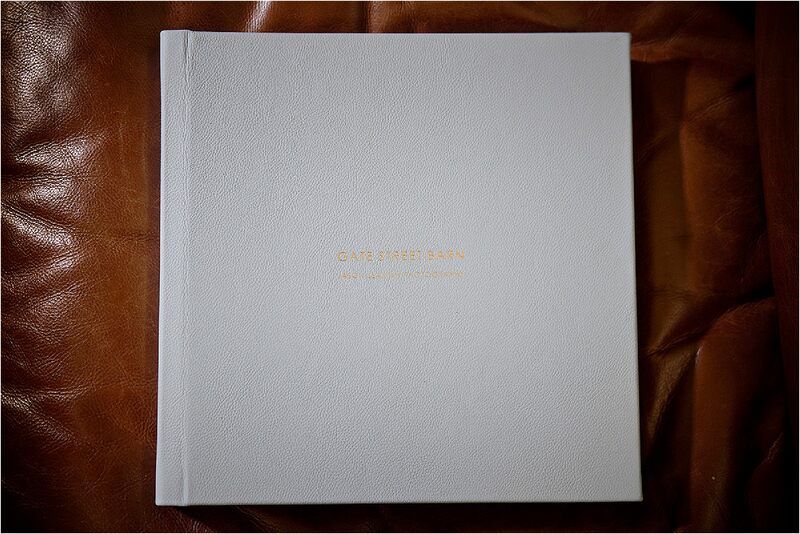 We’re more than proud to be able to say we produce the finest wedding books you can get and the represent incredible value too.